Today, I want to share one of my favorite resources when you’re in a season of suffering. I’m forever grateful to friends and family who shared books and resources with me. I had no idea what to expect in grieving or single parenting or helping kids navigate their own grief. I suddenly had a voracious need for books that could speak to our situation. I didn’t want candy-coated platitudes. I needed two things: the truth of God’s Word and the testimonies of others who had walked through suffering and could declare that God’s promises are true. Enter Streams in the Desert. A dear friend gave me this book because it had been such comfort to her family in their own time of deep suffering. Isn’t that how it should work? To pass on to someone else the comfort that has so helped us? Streams in the Desert is a 365-day devotional mix of prayers, Christian writings and promises from God. 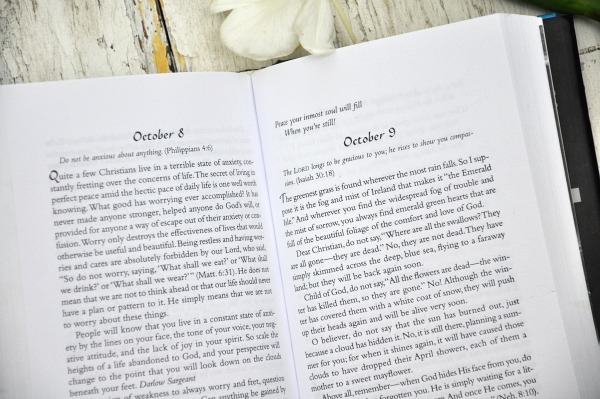 Every year, it continues to be one of the best-selling devotionals. I think this book speaks to so many because it was written from a place of suffering to the person walking through suffering. It’s chock-full of scripture, poems and application that provide solid hope and encouragement “in the barren wilderness” of need. This giveaway will remain open through Friday, October 9 at midnight. Winners will be notified by email or Facebook message. The book must be mailed to an address in the contiguous 48 states. Feel free to share this. And when you comment, I’d love to know what your favorite devotionals and resources have been to help in hard times. This is Day 7 in our 31 Days series on Braving the Broken. If you’d like to join, I’d love for you to subscribe here and read along with us. You can find all the posts in 31 Days: Braving the Broken here. Hi Lisa, I would like to win a copy of the book. I would love to read this book. Thank you for the giveaway chance. I really love to read Stormie Omartian’s prayers when I am struggling. She has a way of praying the scriptures that is so helpful in difficult times. Hi Lisa, I am currently felicitating a class study called ‘GriefShare at a Christian Women’s center in Owen County. Recently two ladies have started coming and they are both young women who have lost their spouses suddenly. This book would not only be helpful to me to encourage others but for them as well. Is there anyway this book is available other than here? I have been encouraged by what you have shared this week and would love to open the book Streams in the Desert, it’s one I have not read before and it sounds like it would be helpful. Keep up your encouraging sharing, it makes a difference. Love that through all you have been transparent and still are. It’s a great encouragement to us. Look forward to your posts each day. Good Morning Lisa, This too has been one of my favourite devotionals. I haven’t read it for a number of years now. Would love a new copy. Thank you. I love Streams in the Desert. Written with faith that encourages us to press on, trust, and finish well. I already have a copy, so I do not need to be entered in the drawing. Thanks Lisa. I love this devotional. My husband and I just lost our first child when I was 27 weeks pregnant two months ago, and I had forgotten about this devotional. Include me in the drawing! Didn’t know the book was written by someone in a situation of suffering. Do you know the background story? Someone annonously sent me a copy of a page of this book and it was such a huge blessing to me. I have wanted to have a copy of the entire book ever since! I would be so blessed to win! I turn to Jesus Calling by Sarah Young again and again for daily inspiration and comfort. However she wrote another daily devotional called Jesus Today at a really tough point in her life and I found that especially helpful during some of my hardest struggles. I love to read Jesus Calling. Every day it offers me so much insight that is absolutely perfect for on that exact day. It’s actually incredible. Hi Lisa! This is just the book I need after losing my father a few months ago. I also have a dear friend that I’d love to share it with who is going through her own personal suffering of a broken heart and home. Would love to win this! Thank you for sharing your faith journey with those of us in need. You blog is a blessing to help trust God as we go through life. Lisa- I’ve been enjoying your 31 Days Braving the Broken session. Loss is very hard no matter the circumstances. Thanks for posting the Streams in the Desert recommendation/giveaway! I hadn’t heard of it and it looks like a good one for comfort and hope. Thank you. This book has been recommended to me time and again and I have yet to read it! I would be thrilled to win a copy in your giveaway. With my cancer diagnosis I have also turned to a stack of books on suffering. This is not one I had heard of so I will definitely explore it. I find that getting other people to accept reality is sometimes the hardest task. I have been enjoying Voices from the Past a collection of Puritan writings. Lisa; your post over these past few days have been a real blessing to me. Thank you so much for sharing your journey. I too; over the years have been drawn to reading more & I enjoy reading books that I can apply to my life. I have Jesus Today by Sarah Young that I bring to work but i also enjoy reading the Journey Devotional Magazine & the In Touch Magazine by Charles Stanley. I recently read Priscilla Shirer’s new book God is Able which was truly a blessing also. I would love to read Streams In the Desert & add it to my daily inspiration. Thanks again & God Bless you & your family! Hi Lisa, no coincidence I saw a pin for this series. HUGE blessing. Would love the book! I am being blessed by your series thank you so much for all you do. I’ve come to enjoy and rely on Jesus Calling, given to me by a good friend months ago during a very difficult time. The book sounds wonderful! One that has really helped me over the past year since my husband died is Healing After Loss: Daily Meditations for Working Through Grief by Martha Whitmore Hickman. Calm my anxious heart by Linda Dillow is a good read. I read it during a Bible study a couple of years back. It’s specifically for women. I would love to read Streams in the Desert!! Thanks Lisa! 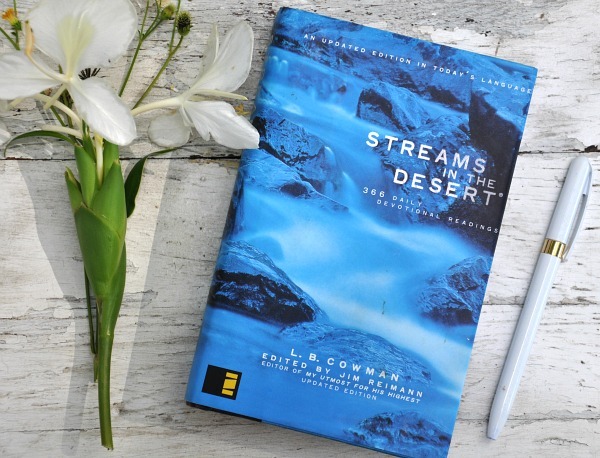 I love reading “Streams in Desert”! I’ve found it very encouraging. I found you on the Write31Day facebook and am enjoying your series:) Thank you for sharing it with us! This is a great devotional with beautiful words to lift us up. I’d like to give my friend a copy to encourage her in her daily life. I’m so glad that I found your blog and I would love a copy of this book! Lisa, I have a very old copy of Streams in the Desert that I absolutely cherish. I’m not surprised you found it comforting … it’s wonderful! Thanks for introducing me to this devotional. It sounds like it’s exactly what I need right now. Thank you for the giveaway, too! Thanks for the give away.I would love to win this book. I will take any book that can help me lift myself out of this place. Would love to win a copy of this in my new journey to follow Christ. 🙂 Big Smiles! Springs in the Desert was PWOC’s mantra the past year! LOL! I live in the desert! I love for aqua ducts of love & blessings to overshadow the regular stuff that everyday life burdens us! I know this is so much later than the dates that it shows…Much of Jesus’s love to you! Keep the word ALIVE!! !